Mike and I made a bit of a lifestyle change in mid-August when we started following the 5:2 way of eating. This involves eating perfectly normally most of the week, but drastically cutting back calories on two days to 500 for me and 600 for him. It's been going pretty well and I've set up a separate blog about it, with recipes and so on, as it doesn't really fit into the theme of this one. Today was a not-a-fasting day (hurrah) and I took advantage of it by making this delicious tart. The recipe is from Nigella Lawson's How to be a Domestic Goddess, where it's called German Plum Tart. In my version I used two slightly spongy apples (which were sitting neglected in the fruit bowl and destined to become compost if I didn't do something creative with them) and two peaches instead of the plums called for in the recipe. The final layer is a crumble of flour, sugar and butter (I didn't have the walnuts or pecans that the recipe called for). The syrup sinks into the dough and the crumble on top crisps up beautifully. A perfect treat after a day of abstinence! And then there is an hour or two of feverish chopping, trimming, blanching, boiling, labelling, and freezing to get through before I can walk through the kitchen again without a burden of guilt at the sight of all the unprocessed abundance. Moussaka is about the only thing I can do with eggplant that is likely to be welcomed by the children. As problems go, having too much produce is hardly one to complain about. And I do know that the February me will be grateful to the me of today for freezing all this food. I just wish she was here to help me do it! We've been having a disappointing performance from the chickens in recent months: ever since we merged the new chicks in with the remainder of our original flock we've only been getting one or two eggs a day. In recent weeks this has gone down to just one egg a day and sometimes none. This means that we've been feeding 31 birds and only one of them has been deigning to return the favour. About 12 of those birds are males, so I'm not expecting any eggs from them, but it would be nice if the remaining 19 could pull their weight a bit. I was therefore very pleased to find two eggs today, one of them quite small. I hope this means that our new flock have started to lay: with any luck we will soon be overrun with eggs again, instead of portioning them out as though they're made of solid gold. I had a go at making oven-dried tomatoes this weekend, using some of my crop of cherry tomatoes. It takes quite a while, but it's really worth it: they taste amazing - a really concentrated burst of tomatoey sweetness. I was away at the end of last week and in my absence the cabbage worms have done a good job of eating nearly every leaf on the young Tuscan kale plants which had been doing very well in the greenhouse. I spent half an hour yesterday morning picking the little blighters off. On a broccoli plant I found that one of the caterpillars had already matured enough to build itself a cocoon. I know there's not much logic to it, but I left the cocoon in place. It may well hatch out and lay another devouring army of eggs on my plants, but there's something so wondrous about the transformation of caterpillar to butterfly that I can't bring myself to interfere with it. We lost the top layer of plastic from the greenhouse over the winter and the remaining layer has been looking increasingly battered and torn. 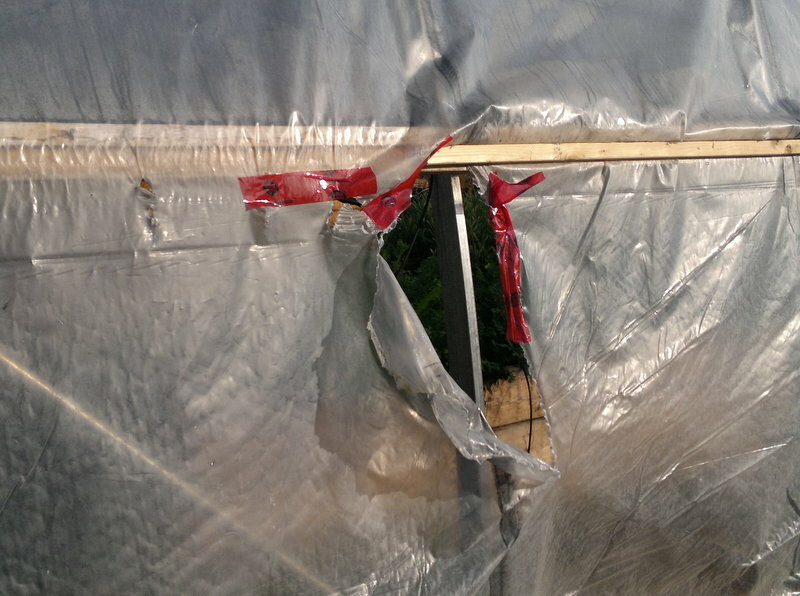 On Friday it was really windy and we had to make some emergency repairs to stop the damage getting much worse. The forecast on Sunday was for a sunny day with little wind, which are ideal conditions for trying to put new layers of polythene over the structure. Four years ago Mike and I did this as a two-person job. 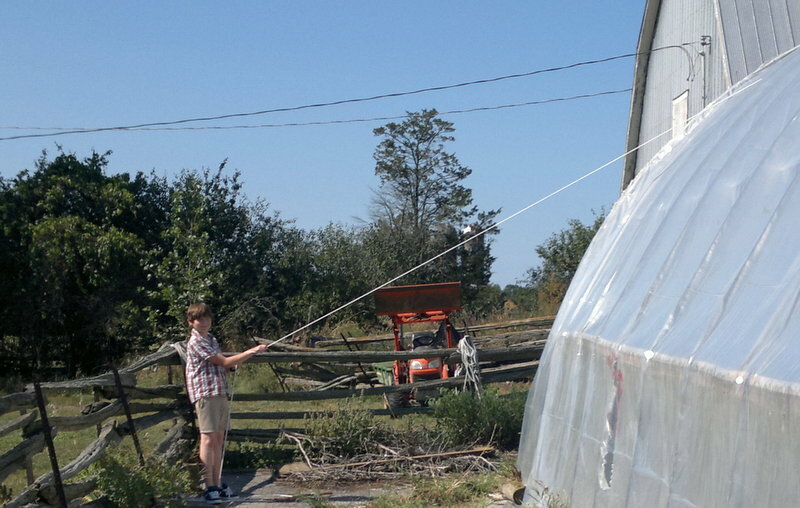 This time, the children were old enough to help pull the sheets over the greenhouse. It was still very hard and hot work, but by the end of the day the sheets were in place and secured along three of their edges. This morning Mike finished securing the fourth edge, along the arch on the eastern side, a job complicated by a phalanx of curious wasps. If you don't like wasps much (and I don't know many people who do), being at the top of a ladder while they are buzzing around your head can be rather stressful. As if being up a ladder, doing a tricky job, in blazing hot sunshine is not stressful enough. My job, as usual, was as ladder ballast. Silently-praying-that-Mike-doesn't-fall-off-the-ladder ballast. We still have to sort out the 'skirts' of the greenhouse, securing the long edges which roll up below the wooden battens, but at least those can be done with feet on terra firma!